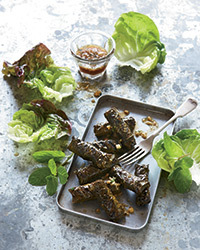 Grilling meat and seafood inside a leaf wrap is an ancient way to keep them moist while creating sweet, nutty flavors. 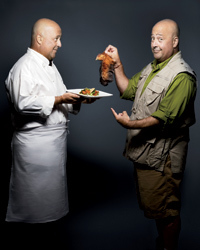 Host of TV's Bizarre Foods and F&W contributing editor Andrew Zimmern teaches the technique. Think of grilling, and words like charred and seared come to mind a lot faster than steamed. 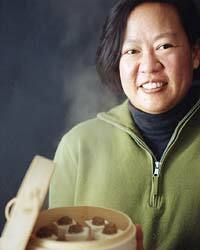 And yet, cooks all over the world steam food over a fire’s bone-dry heat. One great way to do it is to wrap ingredients in leaves. In addition to keeping food moist, this method can add marvelous flavor. “The oils in the leaves produce a sweet, nutty aroma that infuses whatever they’re wrapped around,” says Andrew Zimmern, host of the Travel Channel’s Bizarre Foods series and an F&W contributing editor. We asked Zimmern to share the best leaf-wrapped recipes he’s had around the world, from Mexico to Vietnam. In addition to the dishes here, Zimmern offered instructions for Samoan-style eel wrapped in taro leaves and cooked in a pit alongside a whole pig and lamb, but we decided to hold off. Here, a step-by-step guide to making Andrew Zimmern's Yucatán Pork with Annato and Ancho Chiles. This classic Mexican dish of pork shoulder and spices uses a double-layer of banana leaves for cooking, but the thick, fibrous leaves are not edible.